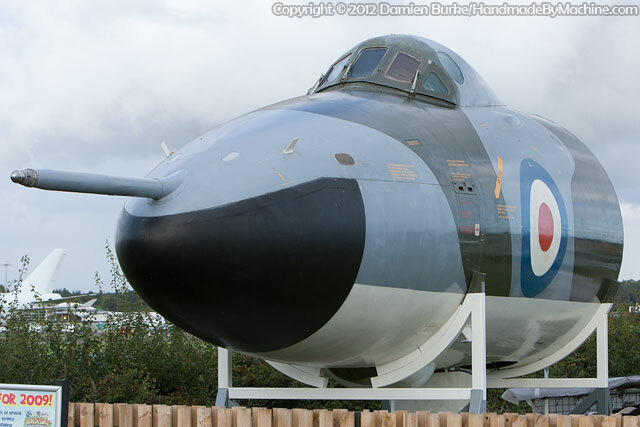 Built in 1959, XH537 was delivered to Boscombe Down on the 31st August. In January 1960 she was chosen to be one of the Skybolt development aircraft and in June 1961 work was complete and she flew with dummy Skybolts (one of which is now preserved at Cosford). After Skybolt's cancellation, she had her Skybolt kit removed and entered normal RAF service with 230 OCU at RAF Finningley. In 1978 she was converted to a B.2MRR and moved to 27 Squadron. In March 1982, as other Vulcans were being prepared to go to war, she made her last flight, being delivered to Abingdon to be a maintenance airframe. She lasted for nine years, being scrapped in May 1991. The nose was saved and bought by Vulcan fan Colin Mears in 1994, moving on to another fan - Paul Hartley - in 1997. There had been a plan for XH537's nose to carry out a final duty - acting as a crew escape and rescue trainer for XH558, however in late 2001 she moved to Hurn instead, and her restoration (sponsored by Channel Express) was carried out there (as you can see). In March 2003 she was sold to the museum and has a permanent home there.